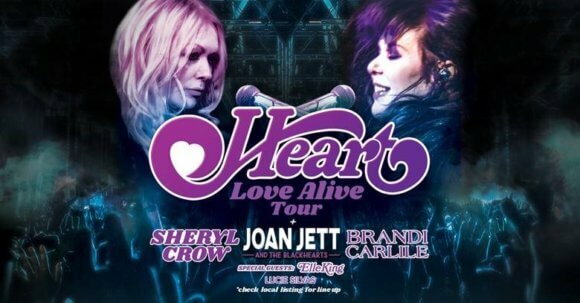 Heart will be back on the road for the first time since 2016, kicking off their “Love Alive” summer tour on Tuesday, July 9, 2019 in St. Louis, MO, at the Hollywood Casino Amphitheatre. The rockers will put on 39 concerts during the “Love Alive” tour, stopping in cities including Cleveland, Detroit, Indianapolis, Atlanta, Dallas, and Portland. The tour will wrap up on September 9, 2019 in Los Angeles at the Hollywood Bowl. Ann and Nancy Wilson will be joined on the road by Joan Jett & The Blackhearts, Sheryl Crow, and Brandi Carlile. In addition, Elle King and Lucie Silvas will open select shows. “‘Love Alive’ is a song and a sentiment that goes back a long way with us. It goes forward too. It is a hopeful, positive and universal vibe like we feel this tour will be,” explained Ann Wilson. Both Ann and Nancy promise fans will experience something different from the normal Heart concert with the “Love Alive” tour. “It will be unlike any other Heart tour that has been. Some of the songs will be classic of course, but this tour will be a new animal,” teased Ann Wilson. Tickets for the 2019 concert will go on sale Friday, February 15, 2019 at 10am local time via LiveNation.com.